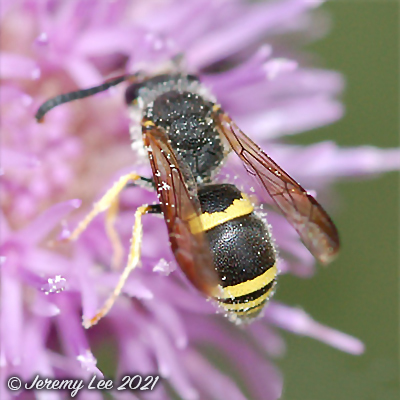 Odynerus spinipes is a Mason Wasp, which are solitary wasps that build mud "cells" in which to lay their eggs. They then catch and paralyse caterpillars before placing them with the egg in the mud cell and sealing the entrance. The wasp larva will consume the caterpillars after hatching before it is ready to emerge from the cell as an adult wasp. As adults, they eat nectar and aphid honeydew. Males cannot sting, and the sting of a female is not painful. They can be found on windows, foraging for nectar on flowers, or searching out small cracks or holes in which to nest.